Home » Posts Tagged "ipv6"
Hetzner offer very well specified physical servers at extremely low prices. I’ve used them for many years and they’ve proved to be extremely reliable. With each server, Hetzner will give you a single IPv4 IP and a /64 IPv6 subnet. 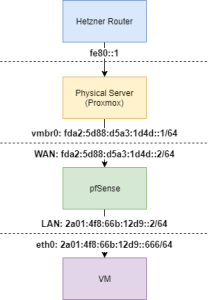 You can also run virtualization software such as Proxmox and it’s often desirable to run a firewall such as pfSense on a virtual machine to protect the other virtual machines. All good in principal, but the /64 IPv6 subnet has caused some confusion. Surely you need some more address space to be able to route the /64 subnet? It turns out, no. Hetzner don’t use NDP or proper IPv6 routing… they seem to just deliver the address space to the server (probably via static NDP entries mapping your /64 to your server’s MAC address). This actually works to our advantage because you do not need to assign the physical server any IPv6 addresses in the issued /64.